Built-In-Wheels make it easy for store cleaning or rearrangement! Center divider panel supports display cabinets and adds visual appeal! Six LED lights illuminate products from above! Sliding, locking doors provide safety for displayed merchandise! 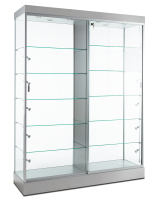 These display cabinets are perfect for retail or commercial locations looking for large cabinets to display a lot of merchandise at once! 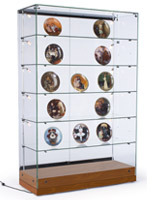 These wide cabinets are ideal for museums, department stores, boutiques, jewelry stores, gift shops and much more. Display cabinets feature a glass back so you can either place the cabinets against a wall or in the center of your sales floor. 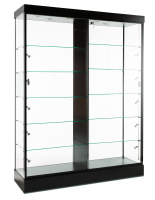 The display cabinets, also known as glass LED showcases, even feature wheels so it is easy to rearrange your commercial environment, as necessary. 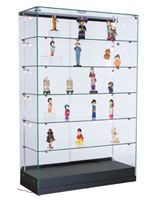 These glass showcases, display cabinets put your best-selling items on display in style! The cases feature a black base, LED lights, and supporting center divider. All glass surfaces of this showcase are crafted from tempered glass to offer a safer alternative to traditional, annealed glass. 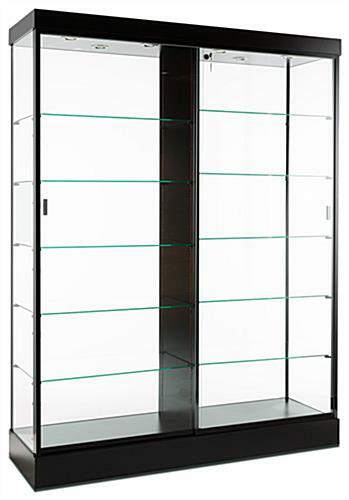 Each side of these display cabinets features five 1/4" thick glass shelves, for a total of 10 adjustable-height shelves, offering 12 levels of display space. Sliding, locking doors provide easy access to displayed merchandise for store associates, but keep products safe from careless customers. 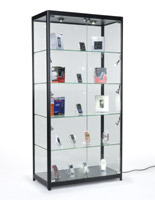 These large, unique display cabinets, glass showcases will be a great addition to your retail store!